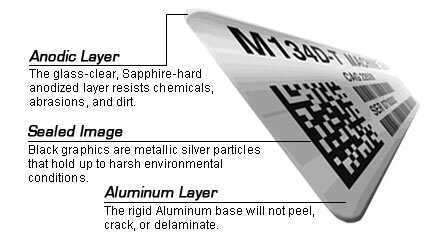 Solutions for MIL-STD-130 data plates & labels with a superior on time delivery record. All-Marks will design and provide UID labels as mandated for all U.S. Government materiel purchases. These labels contain both plain text and a 2-dimensional data matrix barcode that allows government agencies to identify and locate assets in a central database. Confirms that the content included within the 2D Datamatrix code conforms to the DoD’s UID construct format as well as ISO15434 and ISO15418. Confirms that the printed codes meet the quality guidelines as specified by AIM DPM and the most current versions of MIL-STD-130. Verification reports are typically provided electronically.